Professional AV solutions require video to be recieved from a great many different sources and locations. The ability to recieve and display video directly from online resources such as CCTV networks and remote desktop applications and combining them with local inputs has become an everyday part of fully functional video wall display. 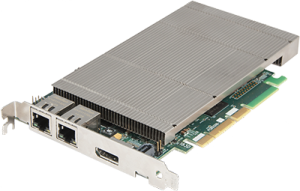 Datapath's ActiveSQX PCIe plug in card is a powerful addition to systems that require a scalable hardware based decoding solution. The ActiveSQX includes a dedicated processor capable of decoding several IP streams simultaneously via the on-board ethernet ports. Fully PCIe compatible, multiple ActiveSQX cards can be used in a single system to provide project scalability giving users more processing and more simultaneous decodes. Datapath's SQX technology is compatible with industry standards for video compression and streaming. The ActiveSQX allows users to decide large numbers of high definition 1080p 60 fps streams and multiple ActiveSQX cards reside in a single system to provide even more decoding capabilities. In addition, the ActiveSQX can be placed in systems alongside graphics cards and video capture cards, such as the Datapath Vision range, to provide a powerful addition to any control room environment. Combine the ActiveSQX with the VisionHD2-SQX to provide full decode and encode capabilities in a single video wall system.